I found this knitting book at the library last week. 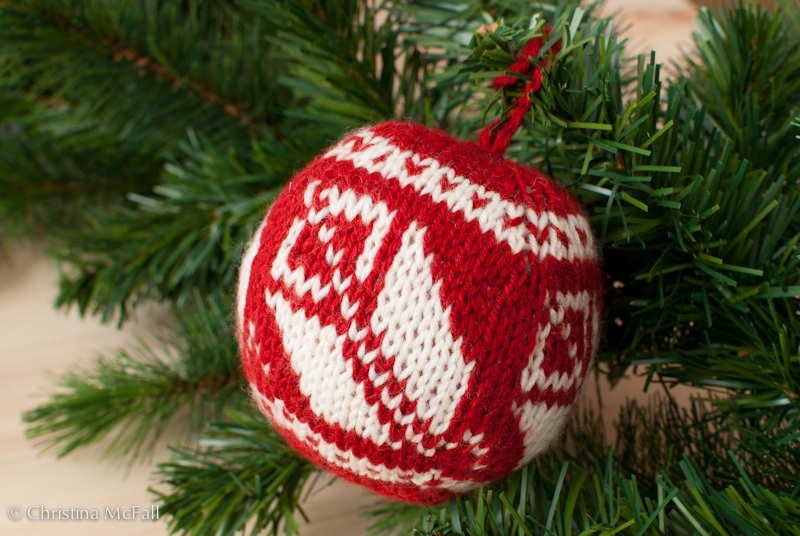 It’s called Julekuler, by Arne & Carlos, and is a collection of patterns for knitted christmas balls to use for tree ornaments, etc. I love going to the library here to look for unusual craft books that I can’t get in the US, but it turns out this book is also published in English where it’s titled 55 Christmas Balls to Knit. Amazon has a good preview of it, if you’re interested. 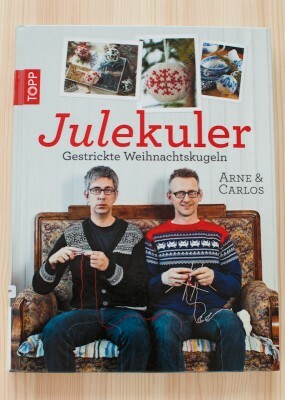 The authors are a couple of quirky Norwegian knitwear designers named Arne & Carlos, who live an idyllic life on a farm in Norway, and apparently still have lots of time to knit. You can see them and their farm in this short youtube video: Arne and Carlos video. 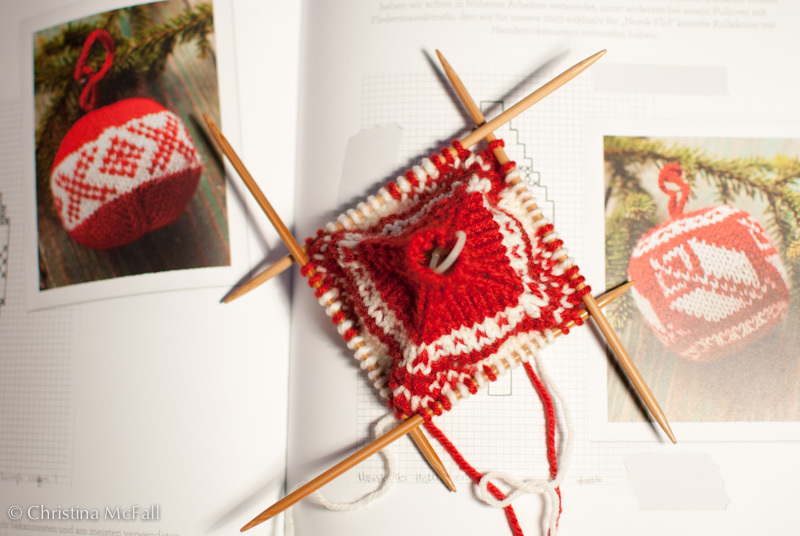 Double-pointed needles + colorwork + a lot of increases and decreases makes this a bit time-consuming. However, I’m very pleased with the result, and I’m sure I’ll be faster on the second one. I also chose to knit this with acrylic because that’s all I had on hand in the right color and gauge, but I will definitely use a nice wool next time, and maybe even stuff it with wool batting as suggested in the book. Small projects that require a lot of work deserve to be made in fine materials, don’t you agree? Previous post: daily photo: star lights	 Next post: Happy Holidays! 3 Responses to "Knitted christmas balls"
I just bought this book, and am so excited about knitting some of these, but I could not understand their instructions and pictures for increases and decreases. Will the usual methods of making one or knitting front and back to increase and knitting 2 together to decrease work? Yours looks great!